...quantum mechanics—the physics of our world—requires that you hold such pedestrian complaints in abeyance. ...things are the way they are in our universe because if they weren't, we wouldn't be here to notice. Greene has worked on a particular class of symmetry relating two different Calabi–Yau manifolds known as mirror symmetry (concretely relating the conifold to one of its orbifolds). Aspects covered in this book include non-local particle entanglement as it relates to special relativity and basic explanations of string theory. After attending Stuyvesant High School Greene entered Harvard in 1980 to concentrate on physics. He also described the flop transition a mild form of topology change showing that topology in string theory can change at the conifold point. 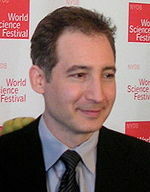 Brian Greene (born February 9 1963) is an American theoretical physicist and string theorist.